This on trend timepiece from AVI-8 is a classic aviation inspired chronograph. Its classic case houses detailed dials, colours, and graphics that celebrate the spirit and adventurism of an era gone by. Straightforward hour indexing, bold hands, and detailed vintage designed sub dials of the chronograph are all blended to create a timepiece that is elegant in design, precise in performance and stylish in its comment on the wearer. Strapped with a genuine leather strap that is both dressy yet casual, this is a timepiece that nods to chivalry and performance. 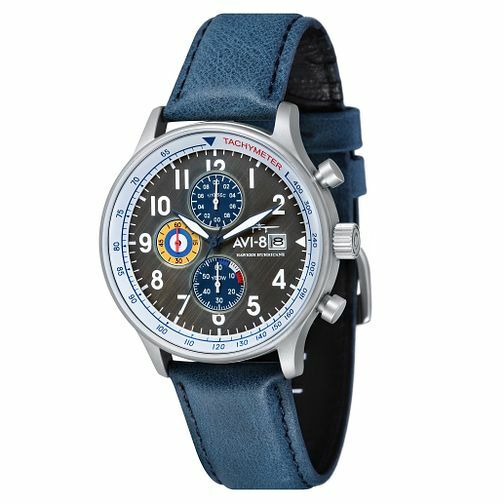 AVI-8 Men's Hawker Hurricane Blue Leather Strap Watch is rated 3.0 out of 5 by 1.